The number of pay TV subscribers in Sub-Saharan Africa is due to increase by 74% between 2017 and 2023 to reach 40.89 million, according to new research. The Digital TV Research report claims that over the same period Sub-Saharan pay TV revenue will climb by 41% to US$6.64 billion, with subscriber growth outstripping revenue as competition increases in the market. 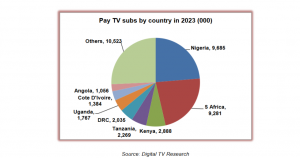 The ‘Sub-Saharan Africa Pay TV Forecasts’ study claims that Nigeria will have the most pay TV subscribers by 2023 after overtaking number two market South Africa in 2021. By the end of the forecast period Kenya, Tanzania, the Democratic Republic of Congo will make up the rest of the top five pay TV countries by subscribers. Overall the top eight Sub-Saharan markets will supply three-quarters of the subscriber total by 2023. “Pay TV competition in Sub-Saharan Africa is becoming more and more intense, especially given the launch of Kwese TV in 14 countries during 2017,” said Simon Murray, principal analyst, Digital TV Research. According to the research, by the end of 2017 Multichoice had 12.48 million subscribers across satellite TV platform DStv and DTT platform GOtv. This is expected to grow to 16.66 million by 2023. France’s Vivendi had an estimated 2.96 million subscribers for Easy TV and its Canal Plus satellite platform at the end of last year, and this is tipped to climb to 4.87 by 2023. However, StarTimes is expected to experience the most impressive growth – from 6.23 million subs to 13.42 million over the forecast period. Digital TV Research said that at the end of 2017 there were 23.49 million pay TV subscribers in Sub-Saharan Africa – 13.78 million satellite TV customers and 9.11 million DTT customers. By 2023 it expects there to be 20.89 million satellite TV and 17.53 million DTT customers.